In a small bowl, mix together crème fraiche, cream, horseradish, and mustard to make a dressing. Finely dice onion. Cut pickles into thin medallions. Roughly chop dill and parsley. Core apple, quarter, and cut into thin slices. Cut herring fillet into bite-sized pieces. 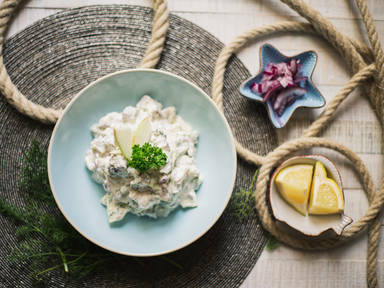 In a large bowl, combine onion, pickles, parsley, dill, apple, herring, and dressing. Squeeze lemon juice into bowl. Stir thoroughly to combine. Enjoy alone or with a thick slice of rye bread!